After I saw the wolf, I went back inside, trying to determine the possibility of it belonging to THEROS. Maybe they had sent the wolf in search of me to see if I was still alive... Maybe THEROS hadn't known I had been captured and was confused as to my lack of action at his note... Had they even tried to contact me recently? I hadn't received anything... Maybe THEROS had sent the wolf out to look for me so they could begin sending me notes again... I tried not to read too much into it; it was still possible that it was a feral wolf that got a bit nosy... Twice? I eventually shook it from my mind and tried to concentrate on something else. I had finished luring the cow into the pen, and I was happy with the time it had taken to do that, as well as actually build the cow pen! If the pen was strong enough to hold the cow, only time would tell, but even from looking through the window, I got the impression the cow didn't mind all that much. There was plenty of grass and wildflowers for it to eat. Admittedly there was a considerable lack of space that it was used to, but hopefully it wouldn't matter too much. I went over to the bed, and picked up the book about cattle I had been reading; it proved surprisingly useful despite Chiron's lack of cooperation. He was now curled into a ball in the corner next to the stove. I wasn't really too bothered as things had worked out as planned - more or less - and I wanted his paw to get better. Which reminded me: I was going to have a look at it soon... Putting the book back into the shelf, I decided that now would be a good time to go and get another book. However I was intrigued as to what I could find in the library below. 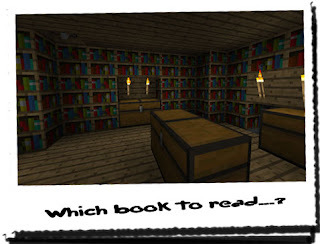 It was chock full of books, and could possess information that could prove invaluable to me! Either that, or a load of nonsense that I would never use in my life, ever! I went over to the corner of the house, where the large painting hung above a slightly elevated step. Bending down, I reached out and pressed the small notch that stood camouflaged against the wall, and watched as the slabs slid to one side underneath the step. I looked down into the small hole, and became very anxious for some reason... Maybe it had something to do with the incident that happened last time I went down into a small passageway... I shook it from my mind, knowing that was impossible. No-one would be here without me knowing about it! Surely... I lowered myself into the hole and began to descend the ladder. As soon as I reached the bottom, a wave of heat crashed over me! I had forgot about that! The lava that had blocked the path before had been covered over with a series of hidden slats that covered the lava when the lever was pulled. I hadn't reset the lever from the first time I had been down here, so the slats were still in place. Still dubious as to the integrity of wooden slats over a channel of lava, I took a tentative step forward, making sure the slats could bear my weight. After I had convinced myself, I began the short walk across to the other side. I exhaled a sigh of pure relief when my foot hit the cobblestone on the far side, however it was short lived when I realised I would be crossing it again in a few minutes time... Well, that depending entirely on whether there was a decent book to read... And if I didn't get carried away! I don't know why I took a photo of the library... It seemed appropriate at the time, and I'm glad I did. Before putting the camera away, I examined the image as I do with every one I ever take. Looking at it more closely, I noticed something in the top left corner... What was that? I first though it might have been my thumb getting in the way; with it being a small LCD display, the image made it hard to distinguish. Looking closer however, I noticed it wasn't a thumb... Looking up from the camera into the position the object appeared in real life, I noticed something I had completely ignored... How could that be? I had been in here twice, and this was the first time I had noticed it! I had looked around the room in awe, from the top of every shelf and yet this had remained hidden! Looking back at the image and back to the object, I couldn't quite grasp how fortunate my timing and placement in the library had been. The object - initially thought to be my thumb - turned out to be a lever! Near the ceiling, and hidden partially by the wall, the handle of a lever stuck out! Putting the camera away, I walked over to it, reached up and pulled down on the handle. A screeching noise, followed by a few thunks caused me to jump back! I had had enough of traps and hidden objects to last me a lifetime, and here I was still finding them! Chances are, one of these days I was going to find a trap that wasn't so nice... Was this one of them? After a few moments, I noticed a small section of the bookshelf begin to slowly slide away into the wall! Just above where the lever had been, a small hole was widening, to reveal a small, brightly lit room! What was this? The screeching noise slowly stopped, and the bookshelf now had slid right into the wall adjacent to it. Peering in, I noticed that the room was very small. 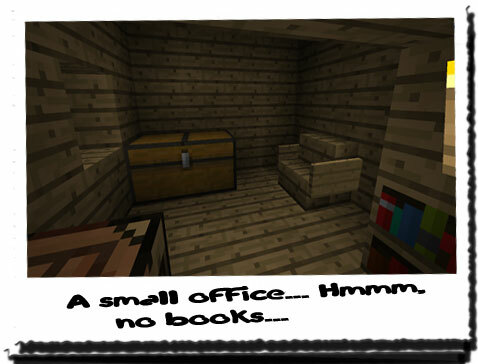 It possessed no bookshelves like the hidden library did, instead, there was a chair, a chest and a crafting table... 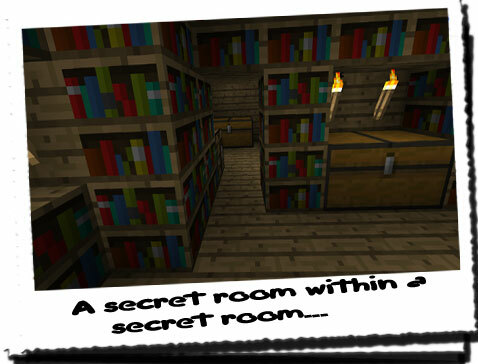 Gathering confidence, not knowing what to expect, I inched closer into the room, expecting a Creeper or a zombie to appear out of nowhere, or a strange cage contraption to be hidden just out of sight! But there was nothing else in the room except the wood that made up the walls. 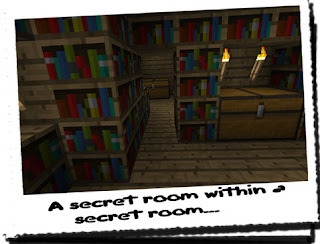 Knowing the room was empty, my main worry now was the bookshelf sliding back into place and trapping me, but after a few moments of silence - except my laboured breathing, and pounding heart - I decided it is probably safe.